New York City: Largest Ice Sport Center Approved in the Bronx. 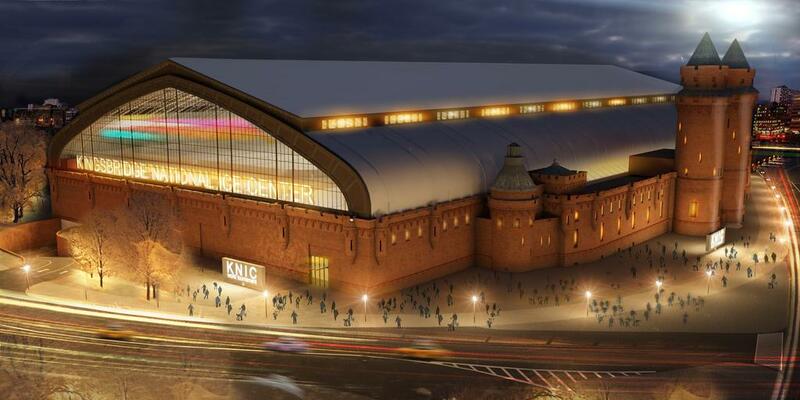 Rendering of approved Kingsbridge National Ice Center. Image courtesy of NYC Mayor’s Office. Council Member Cabrera outlined the details of a Community Benefits Agreement that would address local community concerns. The New York City Economic Development Corporation will administer a $250,000 traffic mitigation study funded by KNIC Partners. The Department of Small Business Services will create a Kingsbridge Road Business Assistance Program to provide and prioritize meaningful assistance for businesses on the Kingsbridge Road Corridor. KNIC will contribute $25,000 towards a public marketing and incentive campaign to encourage the public to utilize mass transportation to and from the Ice Center with the goal of reducing parking demand. Lastly, the Bronx Museum of Arts will establish an art contest for local students to have their art displayed within the Ice Center. City Council: Kingsbridge National Ice Center (C 140033 ZMX – Zoning Map Amendment); (C 140036 ZSX – Special Permit); C 140036 PPX – Disposition of City-Owned Property)(December 10, 2013). 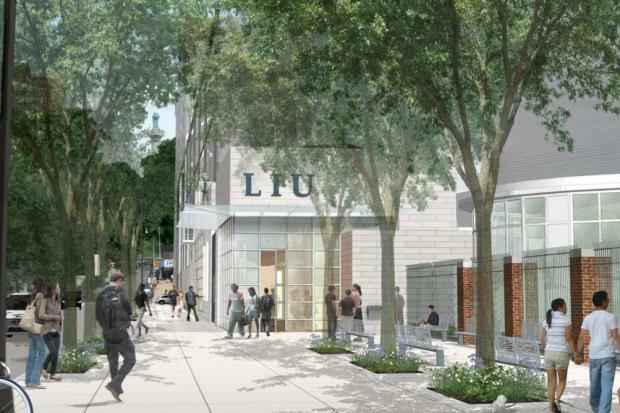 View of Long Island University Expansion from Willoughby Street. Image credit: Cooper, Robertson & Partners. On December 19, 2013, the City Council unanimously approved an application submitted by Long Island University to expand the college’s athletic fields. The City Council approved a City map change that enables LIU to extend and reconfigure its athletic field dimensions to achieve NCAA, Division I and Northeast Conference soccer field standards. The project also provides enhancements to City public space, including improved street lighting, public seating areas at Fleet Plaza and along street frontages, and additional plantings and street trees along Willoughby Street and Ashland Place. LIU’s soccer field is located on a large block bounded by Willoughby Street to the north, Ashland Place to the east, Dekalb Avenue to the south, and Flatbush Avenue and Fleet Place to the west. It is located at the northeast corner of LIU’s campus, which comprises approximately 11-acres of Downtown Brooklyn. The City Map amendment will involve narrowing, and in some areas closing, portions of Willoughby Street between Fleet Place and Ashland Place, and a portion of Ashland Place between Dekalb Avenue and Willoughby Street. The development will also include the delineation of public access easements, including any acquisition or disposition of property in the area. City Council: Long Island University (C 130040 MMK – City Map Amendment)(December 19, 2013). 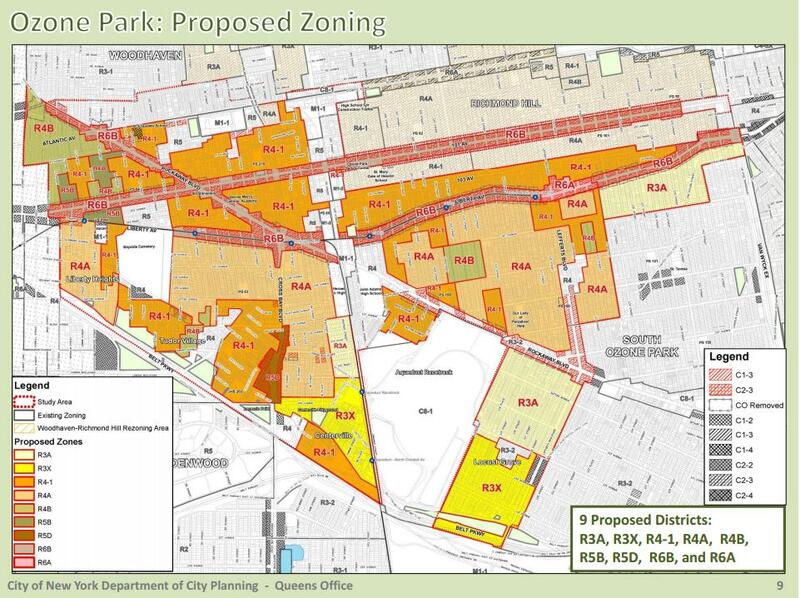 Map of proposed rezoning in Ozone Park, Queens. Image credit: Department of City Planning. On December 10, 2013, the City Council voted 49-0 to approve the Ozone Park Rezoning, which proposed to change the Zoning Map for approximately 530 blocks in Ozone Park, Queens. The Ozone Park rezoning application was submitted by the Department of City Planning to address concerns raised by Queens Community Boards 9 and 10, local civic organizations, and local elected officials that the existing zoning map do not closely reflect established building patterns or guide new development to appropriate locations. The rezoning will reinforce neighborhood character and established building patterns by replacing existing zoning with new, lower density, and contextual zones. The rezoning will also support the area’s predominant one- and two-family residential dwelling character, while directing moderately-scaled new residential and mixed-use development projects to locations along the area’s main commercial corridors and near mass transit resources. Finally, the rezoning would prevent commercial encroachment into residential areas by reducing the depth of commercial overlays. 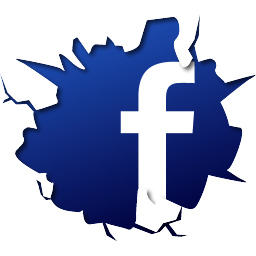 City Council: Ozone Park Rezoning (C 140079 ZMQ – Zoning Map Amendment) (December 10, 2013). 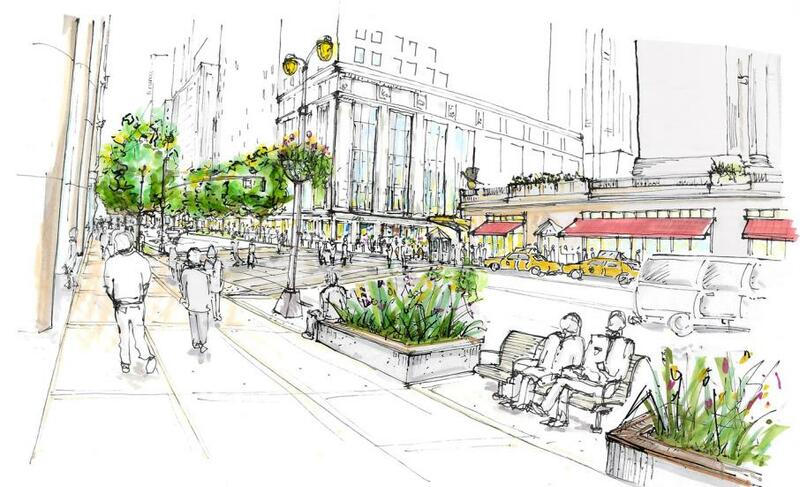 Public Realm rendering from East Midtown Rezoning Proposal. Image credit: DCP. On November 14, 2013, the City Council voted to approve a motion to withdraw the East Midtown Rezoning application by the Department of City Planning to rezone, protect and strengthen 73 blocks in the East Midtown business district. The zoning map amendment would have changed an existing C5-2 District to C5-2.5 and C5-3 Districts in the area bounded by East 43rd Street, Second Ave, East 42nd Street, and a 200 foot line east of Third Avenue. The East Midtown rezoning would have encouraged the development of new buildings over the next few decades. The East Midtown rezoning area is currently affected by long-term challenges, including aging office building stock, limited recent office development, pedestrian network challenges, challenges of current zoning, and modernization of core office areas by competitor cities. During the unanimous Land Use Committee vote to approve withdrawal of the application, Council Member Daniel Garrodnick stated “a good idea alone is not always enough for us to justify action.” He continued, “We certainly should be rezoning East Midtown, but only when we can do so in a complete fashion, and as many of you know, we were unable to reach agreement on a number of issues in the proposed plan.” Concerns had been raised regarding the methodology and timing of anticipated air rights sale by the City for a District Improvement Bonus, as well as concerns regarding infrastructure improvements, transit, and funding. City Council: East Midtown Rezoning (C 130248 ZMM – Zoning Map Amendment)(November 14, 2013).